Restraining your dog in the car is important for his safety. The Sleepypod Clickit Sport Harness for Dogs is specifically designed to keep Fido safe while riding in a vehicle. This dog car harness has been crash tested using the same assessments that child safety seats are put through. If you have a large dog, you may find it more beneficial to keep him contained in the cargo area of your vehicle. If you think this option would be best, there are barriers that you can purchase to prevent your dog from climbing over the seats. If you'd rather have your canine companion in the back seat, you need to purchase a car harness that's been crash-tested and that will safely restrain him in the event of an accident. If your dog is able to roam freely around the car, he'll be a distraction to you. His body will also become a dangerous projectile in the event of a crash – causing injury to you, your dog and anyone else in your vehicle. Dog owners who've already done the research on car harnesses for dogs know that the Sleepypod ClickIt is one of the more popular choices because the Center for Pet Safety gave it a high rating in its crash testing. 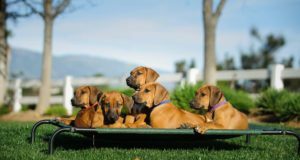 It's designed specifically for dogs riding in vehicles and while most pet owners found it to be one of the best, a few were not completely satisfied with the design itself. Now I've tested this car dog harness myself, and here are my thoughts. The Sleepypod Clickit Sport Harness is designed to be used as a restraint in the car, but it can also be used as an everyday walking harness. Unlike harnesses designed only for walking or car restraint purposes, you get the convenience of being able to walk your dog and then load him directly into the vehicle. For very active and high-performing dogs, the company has a better option called Sleepypod ClickIt Terrain harness (my review here). 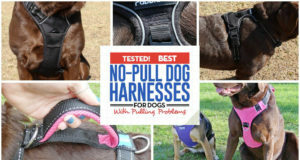 As you will see in my video review above, this dog harness has a unique infinity loop design that allows you to get the perfect fit (you can also see it in the photo below). This loop connects to an energy absorbing padded vest. These two features work together to reduce and distribute the force caused by getting into a collision. The vest is made of luggage-grade, ballistic nylon, and the straps are made of automotive grade material. There are also reflective strips located on all sides of the harness. As I mentioned, these harnesses are crash tested to ensure your dog's safety while riding in the vehicle. They are tested using the same 30 mph dynamic crash test that is used for child safety seats. The Sleepypod Clickit Sport Harness is the only dog harness to earn safety certification and a 5-star rating from the Center for Pet Safety! I love how easy this harness is to clean. The outside can be wiped down with a damp cloth, and I just vacuum off the dog hair that gets stuck inside the padded chest plate. It's also available in Robin Egg Blue, Red, Black or Orange. In my video review I demonstrate how easy it is to put this harness on your dog and restrain him in the vehicle. The Sleepypod Clickit Sport Harness is a step-in harness, which means that you need your dog to step his paws into the arm holes of the harness, wrap it up and around his chest and then securely buckle it over his back. It is a bit difficult to adjust the harness the first time, but the good news is that it stays in place very well. Unless your dog gains or loses weight, you shouldn't have to readjust the harness. However, you should still check to make sure that it is properly adjusted every time you put it on your pup. Once it's properly adjusted, the Sleepypod Clickit Sport Harness is a breeze to secure in your vehicle. You just have to pull out your seat belt and thread it through both sides of the infinity loop design on your dog's back. Then just buckle and tighten the belt, and your dog is ready to ride! Depending on the size that your dog needs, you can purchase the Sleepypod Clickit Sport Harness on Amazon for $69.99-$89.99. While it is quite a bit more expensive than a traditional walking harness, I think this product offers a good value for the money spent. The Sleepypod Clickit Sport Harness for dogs has a unique infinity loop design and an energy absorbing padded vest. These two features are scientifically engineered to work together to reduce and distribute force in the event of an accident.